Christmas Eve. 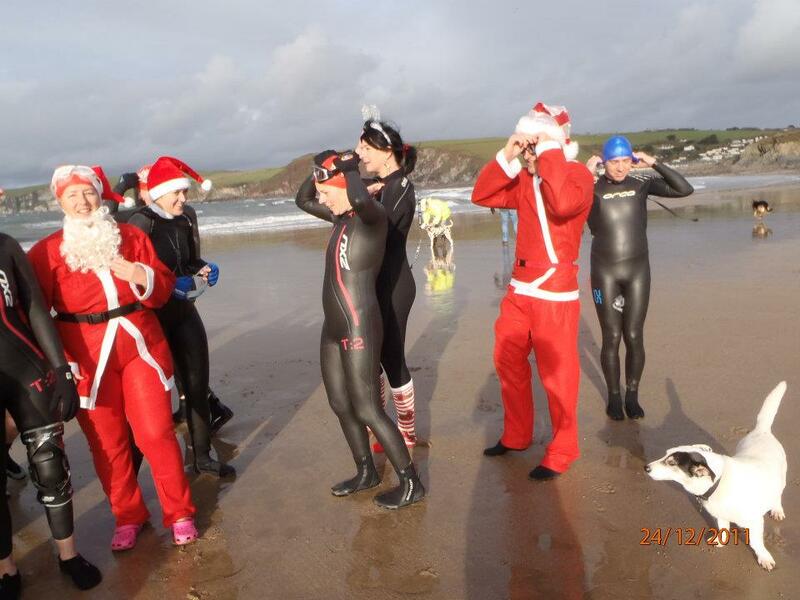 A Santa swim at Burgh Island. Ssswwwwell - and how. 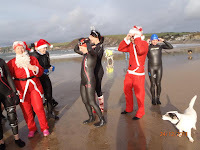 We set off, a motley crew of Santa-clad swimmers, into the surf that was roaring to the west of the island. A strong south westerly wind pushed into our bodies and faces, rolling huge walls of water at us. Every so often I got a massive mouthful and I can still taste the salt as I write. As we approached the first corner, and were bumped and bounced about in the most undignified manner, it was time to decide whether to push on or turn back. I was in two minds, given the roughness of the sea, but got caught up in the moment and decided to keep going. At the back of the island I had a moment of fear, as I got separated from the others, and started to feel tired. It just felt as though I wasn't going anywhere. I kept going and eventually pushed through it. Yet, even at that moment, I was also glorying in the sheer solitude in the water out there, in the beauty of the wild rocks and sea, and in that sense of being truly alone in the elements. The final part of the swim was much easier, as the wind was in our favour, and we got regular welcome pushes from the big waves - in the right direction this time. On the way back we stopped for a dip in the Mermaid Pool. What perfect peace, an infinity pool after after the angry sea. As full moon night approached I scanned the skies anxiously, hoping for a clear night. Dartmoor under a full moon is like another planet. Unfortunately there was a quilt of clouds, so we couldn't see the moon in all its glory, but the Moor was lit up by soft ambient light. I would like to say we slipped into the water in silence, appreciating the still beauty of the night but the reality was a series of blood curdling screams as the various swimmers in t he party came into contact with the lake. Once in though, we calmed down. Moving through the oily blackness, the sound of every ripple was magnified; when you lose all colour, the noise around you comes to the fore. With everything in shades of monochrome, it was like being in a black and white film. Having a destination when you're swimming makes all the difference; the swim becomes an adventure. You can't get more dramatic than London Bridge in Torquay. A natural arch, it just beckons you like a wicked mermaid. We swam through petrol blue sea, occasionally diving down and looking at the pink and white rocks below. What a sense of majestic arrival when we reached the arch. And then, around the corner from there, past gorgeous barnacle-encrusted rocks, dotted with tiny pearly-white winkles, we found the most magical cave. As the swell pushed in and out, we rocked giddily up and down, excited and a little hysterical, inside the womb-like space. Thanks to Jonathan and Lynne for filming it; you can see a video here. In the summer we'd swum off the rocks at Kelly's Cove near Kingswear; it was like being in Greece. Perched on a rocky promontary, surrounded by flat turquoise sea, we plunged into beautifully clear water and dived through exciting underwater channels. (previous entry here) Returning in November it still, amazingly, felt like summer; the sun was out and sparkled on the sea. It was a different matter getting in though, as the swell was pushing vigorously against the rocks, foaming angrily. I felt a bit worried about having brought everyone to swim, as it was rather daunting. Nevertheless, protected by boots and gloves and in some cases wetsuits, we bravely got in. We went in one by one, sitting on the rocks and then pushing out with the swell. Once in, it felt wonderful. The sea was warm, and we were rocked up and down by the swell, bobbing around like corks. Despite the lively sea the visibility was good; I dove down and through a veil of blue I could see white rock below, and then further along, white sand. Delicious. 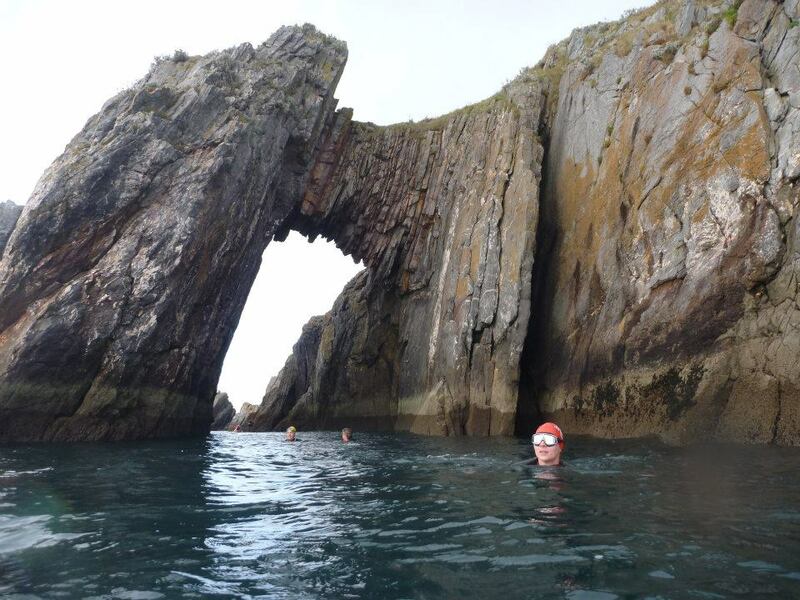 There were Easterly winds today which scotched my plan to swim in Tor Bay. Looking at the map to find somewhere sheltered I hit upon Cellars Beach at the mouth of the Yealm at Noss Mayo. We walked up from the village in a circular direction around the headland, along Lord Revelstoke's Drive. This, as you might guess, was created by the local lord so he could drive his carriage around the coast and enjoy the grandiose views without the bother of walking. The drive follows the massive bulge of the headland, overlooking the uncompromising triangularity of the Mew Stone, and then turns into a path along the estuary where you find the beach. The water was calm, in contrast to the exposed coast around the corner, where huge waves were crashing. Although it didn't exactly feel warm, especially when we first got in, we soon got used to it, relishing the freshness. It is still surprisingly mild. We swam out towards the red buoys (just visible in the left of the picture) and then pottered along the rocky edges of the river mouth. The Yealm on a sunny day feels like the Mediterranean. Boats of all kinds, from gin palaces to painted rowing boats, bob in the water, swinging around with the tide and the wind. We swam from the mouth of the estuary up river with the incoming tide. The sun shone and it was generally glorious to be in the water on a November day. As we approached the boat s we swam 'dot to dot', from one to the next, enjoying the push from the current. We finished at the Ship Inn; their chips come highly recommended. To Burgh Island for my annual birthday circumnavigation. This year it was a very bouncy ride. Big swell and great waves foaming over all the rocks on the way round; gloriously exhilarating. I used my new fins and they really helped. We went clockwise, and as we passed through Dea th Valley (a sort of mini Grand Canyon) the water calmed and flattened, and we got our breath back. While there we saw a pair of baby oyster catchers hopping about high on a ledge. On the last leg, around the western side of the island, we were helped in by the southerly wind and I started to see fish - a large wrasse, and groups of sand smelt flashing around. Afterwards we drank Champagne on the beach; what a perfect day. After an attempt to swim in a lake had to be abandoned because of the presence of toxic blue-green algae, we headed for the River Bovey nearby. We found a beautiful pool, but it was rather shallow. As well as the usual trout, minnows etc, there were masses of balls in the bottom of the pool. We soon discovered why. It was like Piccadilly Circus. Dog walkers passing every few minutes, and then, to cap it all a group of twenty eight Shetland Sheepdogs - or Shelties - arrived. It turned out it was one of the quarterly get-togethers of the Sheltie Owners' Club. When the sea is raging off the South coast of the South Hams, it's often calmer on the eastern side, between Dartmouth and Start Point, and so it proved today. At Beesands, the vast flat ocean spread out as far as the eye could see. The visibility was amazing; as we swam from the shore the shingle dropped away and it felt like being in space. We dived down to the pebbly seabed, before heading up again to the surface. 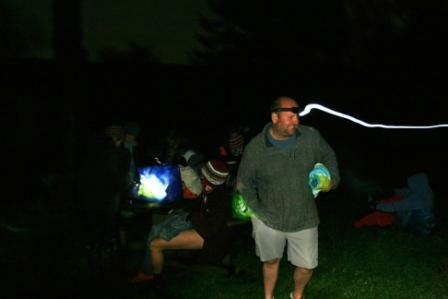 I was testing some glass goggles from Cress i, courtesy of Simply Swim. They felt comfortable on the face, and everything looked crisp and clear; even better they didn't steam up. Apparently because they are made of tempered glass they are less likely to get scratched. Then I tried out some fins from Aquasphere - they were brilliant. They are made of flexible foam and so gently amplify your movement, helping you realise what you're actually doing, and so learn how to improve your stroke. 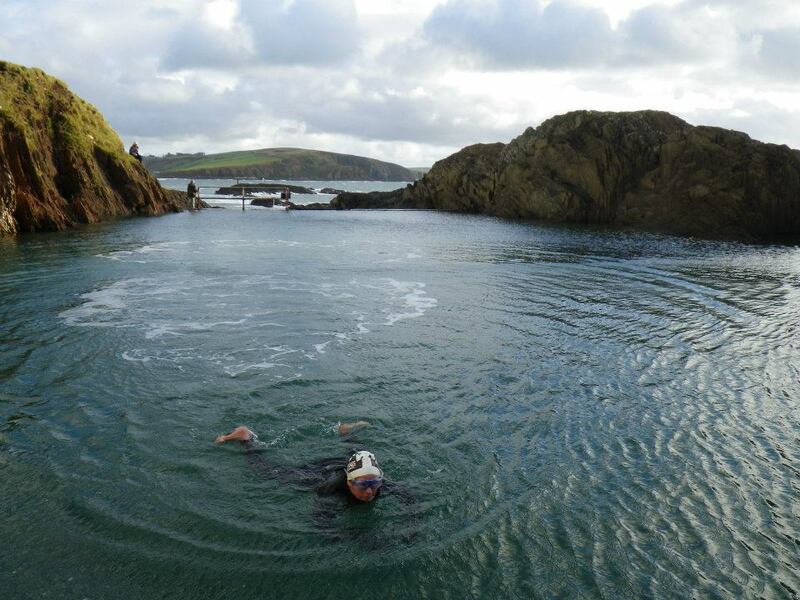 Thanks to the fins I was able to keep up with my friend and swimming guru Kari (which I normally can't), and we swam together down the coastline towards Hallsands. On our return we were against the current, and again, the fins really helped. Thanks to Simply Swim for the gear. It was the second 'Palmer Dart' - a four mile swim between Totnes and Stoke Gabriel organised by the lovely Olivia and Stuart Palmer. We swam on the outgoing tide; as we set off, on cue, the sun came out, glittering and rippling on the water. I was wearing a wetsuit, after a summer swimming without one, and found it difficult to get into a rhythm; eventually I got into my stride. Occasionally I turned on my back and sculled along, looking up at the blue overhead, with buzzards circling and the occasional skei n of geese flying past. About two thirds in the tiredness really hit, but after a couple of pitstops for food and water I was fine. What a great feeling arriving into Stoke Gabriel, exhausted but happy (and last). We revived ourselves with bacon butties at the River Shack, meeting lots of lovely people from the South London swimming club who'd come down from the event...the party carried on in the evening at the village hall, with fish and chips and boogying. Now that's what I call a perfect day. The Sharpham estate lies between Totnes and Dartmouth on the banks of the glorious Dart. We met for an early evening swim round a big bulging bend in the river, upstream with the tide from South Quay to North Quay. The river here is magnificent and stately. As we swam with a gentle current pushing us, the sun gradually set, and at the end we were swimm ing towards a golden path reflected on the water. Prawle Point is the most southerly bit of Devon...and scene of many a shipwreck. I had heard that it has an arch shaped like a horse's head but had never managed to see this natural phenomenon from the shore. We got into the sea at Western Cove, just to the East of the point. There is a whole series of little coves there, like mini swimming pools with steep rocks either side: gorgeous, like being in Greece. As we swam out it got choppier and choppier, but looking towards the Point we still couldn't see the horse's head. Out a bit further, and there was a shout from Judy. "There it is!" A stark silhouette of horses's head, even down to the ears, the sun shining behind it. Ellie and Kate, strong swimmers, managed to swim up to it, but had to climb out rather than swimming back, because of the current. HEALTH WARNING: strong currents around Prawle Point. If you don't want the bother of swimming out to look at the head, you can see a picture here. 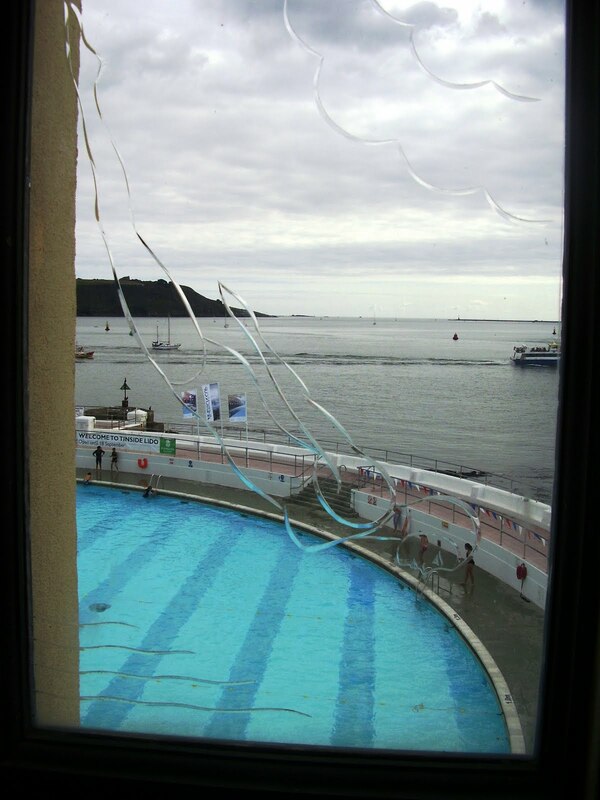 I can't believe I've lived in Devon all this time and never visited Tinside Lido in Plymouth. It is spectacular in its Deco elegance and its sheer scale. On a rocky outcrop projecting into the Sound, it feels like being on an ocean liner. It's a glorious place to swim and a wonderful place to spend the afternoon. With its sunbathing terraces, there is something for everyone. And this year, entry is free. (it's probably the first and last year it will be free). All along the foreshore near the Lido are the remains of concrete steps and smaller tidal pools; the fact that most of them have gone to rack and ruin, and some have been blocked off by the council, is very sad. Ok, it's not Devon, but I just have to share the joys of my recent trip to the Lake District. Number one highlight: Tongue Pot near the Roman Castle of Hardknott, and also various pools around it. Picture the scene: crystal clear waters over pale pebbles, framed by waterfalls; an enchanted atmosphere, it felt as though we were bathing in a secret fairy place. The visibility underwater was amazing . (I know I'm waxing rather lyrical but it really was very romantic). A total contrast was Small Water - which Wainwright says is Lakeland's most beautiful tarn - in the gloom and rain. Here I felt a glorious isolation in murky depths. And finally Coniston - serene and silky. We swam off a stark wooden jetty and picnicked on a promontory overlooking Wildcat Island. Needless to say I am now re-reading Swallows and Amazons and am loving every word. The annual Burgh Island Race is totally wonderful, organised by the hotel simply for the fun of it. They generously lay everything on for free for the participants, including a scrumptious barbeque afterwards. This year we had a lovely sunny evening, although there was a strong wind and swell. The chatelaine of the hotel, Deborah, oversaw the start of the race from the sea tractor (as you do), and the first part of the swim was tough going. We had to put our heads down and plough into the head wind and chop. Once we'd got round the back of the island though, the wind was a help, not a hindrance. 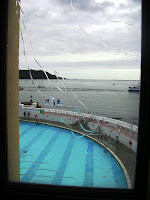 Huge thanks to the Burgh Island Hotel for such a fabulous event. A mire may not be all it seems, particularly on Dartmoor. We tramped through the damp and drizzle, heading towards the blue spot - Leftlake Mire - that we'd identified on the map. Far from being an unpleasant sticky bog, it was beautiful. A vast pool, rather dark and desolate and cold. We swam across the great expanse, and looked back to see an arch silhouetted against the sky; quarrying used to go on here. 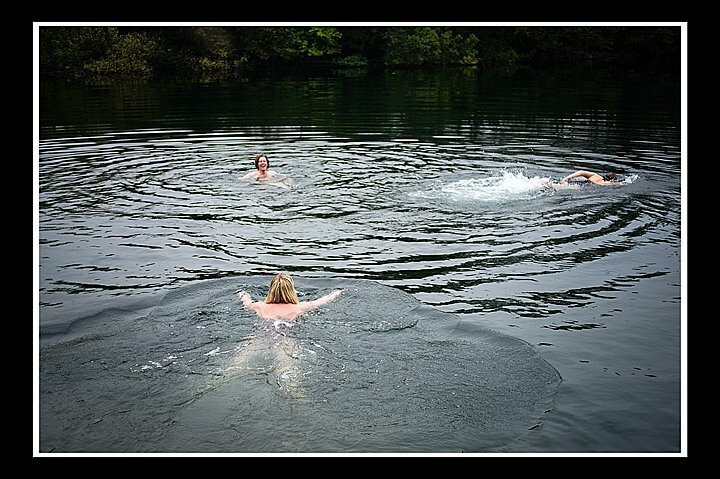 We then attempted a bit of, er, synchronised swimming; an experience bizarrely enhanced by the appearance of our limbs in the water; it looked as though we'd all been a bit overenthusiastic with the fake tan. Hallsands is a ruined village right down near Start Point; it was swept away after shingle was dredged along the coast nearby to build the dockyard in Plymouth. All that remains is the shells of the buildings. It isn't accessible by foot, so we swam there. It was beautiful. The sea was clear and calm; we swam along from North Hallsands and soon the ruins were looming above us, on a great platform of rock. It must have been a tough old life living there and it was a moving experience looking up at the buildings. There is some wonderful old film of the last inhabitants by British Pathe which you can see online here. We set off along the Dart on high mushroom alert, after a reliable source tipped me off that Chanterelles were in evidence. Well indeed they were. This, on top of an unexpected Penny Bun find a few weeks ago, way earlier than normal, leads me to hope we might have a good fungi season. Anyway, Chanterelles safely gathered, we made our way to one of the most charming swimming spots on the Dart. There's a huge cliff down which someone has helpfully erected a metal ladder...you climb down to a massive rock platform, ideal for jumping off. A fter our long sweaty walk, this was the perfect thing to do. We set off to explore a section of the coastpath we'd never visited before, between Kingswear and Brixham. It was an idyllic English summer's day; at the top of the headland the corn swayed like water as we walked through the fields. We got to the edge near Froward Point and found the most stunning craggy cliffs with turquoise water below. The sea was calm and we leapt in off the rocks. The water was so clear, I swear I could see plankton...we definitely saw crabs and a starfish below. There were channels and even intriguing rocky islands to explore, with masses of noisy seabirds including cormorants, shags and terns. ...is a great idea. 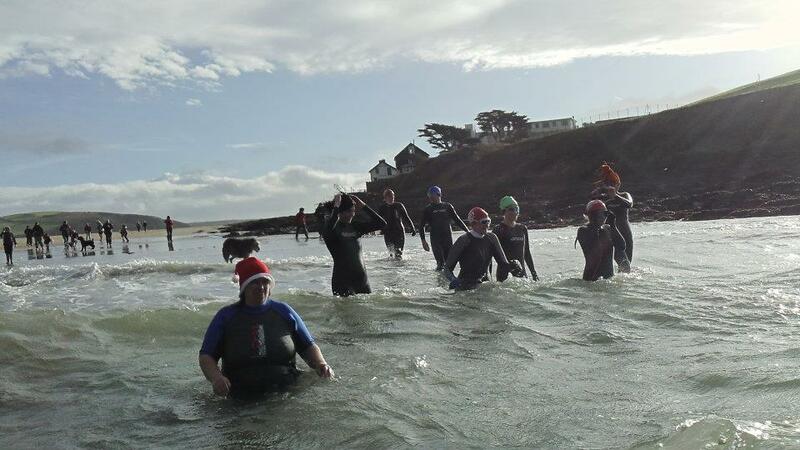 I started off at Cellars Beach at the mouth of the Yealm estuary, and swam up river with the tide. It was a fairly rough old day with a strong wind and a notable absence of sun, but it was a glorious and exhilarating experience nevetheless. A changeable journey from the rocky, choppy grey sea at the start, to the deep green yacht-packed river as I got further up. As I swam up the creek towards the pub, it got shallower and shallower, and the mud was deep, thick and silky. I tried to walk but quickly started to sink. The only thing was to pull myself out over the mud on my stomach, like some primeval creature evolving milllions of years ago from the murky depths. I made sure to do this round the corner from the Ship Inn, so as to emerge with a smidgeon of dignity. You know how when you're travelling along the French coast, little restaurants selling delicious crustacea are two a penny? Yet here, in our island nation, it's nigh impossible to find a place that serves up simply done seafood. Well today I found such a place. Rob, a fisherman in Teignmouth, had told me last winter about his plan to start a restaurant on the town's back beach. It opened at Easter and today we went to check it out. Bingo! I am absolutely raving about this place! We had oysters, the sweetest crab, as well as prawns and wickedly delicious fries on the side. You can also have great seafood platters. Everything was presented beautifully and the service was charming. We sat outside, watching the gulls and cormorants as well as all manner of passing craft. It's called the Crab Shack but sadly I can't provide a link as they don't have a website yet. Swimming with a seal sounds all very lovely but in reality it isn't. ..I think it's something to do with the sheer size of it and the fact it can swim up under you and take you by surprise. I was in Brixham, swimming between Fishcombe and Churston Coves. It is beautiful there. Crystal clear water, and I swam over the most ethereal eel grass beds, which are home to sea horses (but none were visible). I was happily absorbed in my watery world, watching fishes etc, when I noticed a dog in the water. I then did a classic Tom and Jerry style double take when I realised it was a seal...and made a beeline for the nearest rocks. I cowered there pathetically for a while before realising I would have to be brave otherwise I'd spend the rest of the day there. I made my way back, clinging to the shore all the way. Thanks to the girls in the lovely Cove Cafe at Fishcombe for looking after my stuff. We have a new swim to delight you: the Spitchwick Slither. You slide in at the top of the Deeper Marsh end of the river Dart, where there is a grand pool lined with sloping slabs of grey and black rock. Then it's down over the first set of rapids, slithering and sliding over the boulders and getting sucked through the gaps in between them. Wetsuit, gloves, boots, and most importantly, goggles are essential. The latter to spot the rocks looming up ahead. You then reach Higher Corner Pool - a slow, deep pause where you get pulled gently by the current. It's then alternate rapids and pools down to Lower Corner Pool where you emerged, invigorated and amused by the experience that is the Spitchwick Slither.